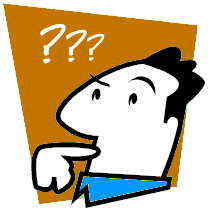 Judith Curry, who used to be a scientist and is now science denier, has asked a question: "How can the fundamental disagreement about the causes of climate change be most effectively communicated?" She claims there is a fundamental disagreement on what is causing the climate to change. She doesn't cite any people who disagree with the fact that increasing atmospheric CO2 is causing global warming. She just asserts that there is "fundamental disagreement". 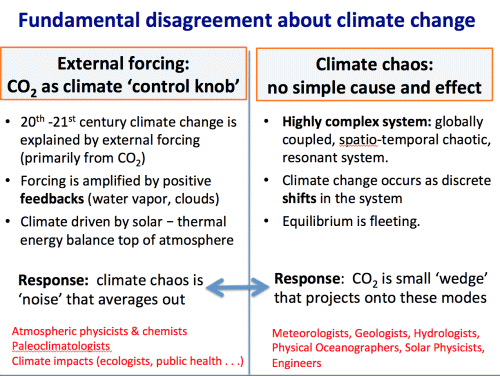 Nor does she explain what she thinks the fundamental disagreement is over, although she hints in a mockup of a slide that she thinks something other than the massive increase in CO2 is causing global warming. What that is only she knows, or doesn't. If she does she isn't saying, which is typical of deniers. Like most deniers, Judith loves to waffle. For example, she wrote about what she calls "climate chaos" and CO2 being a "small wedge that projects onto these modes". 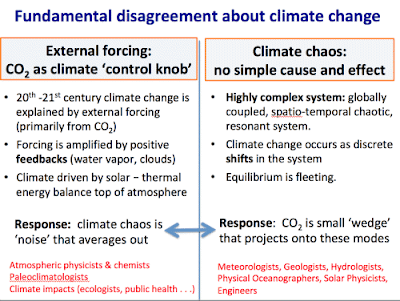 By "these modes" she was referring to "climate chaos is noise that averages out". If anyone thinks they can make some sense of this, please take a shot. Figure 1 | Judith Curry's climate confabulation. Source: Judith Curry's blog. Here's a tip for Judith. Skip the right hand side and expand on the left hand side. She got some of the left hand side of her slide right. Most of the recent warming is caused by the increase in CO2. CO2 forcing is amplified by the increase in water vapour. It's a simplified explanation but not bad for a novice. The thing is, climate isn't chaotic as in unpredictable, it's weather that's chaotic. Weather can only be predicted a few days out. Climate defines the boundaries of the weather (rain, dry periods, temperature, wind etc.). Climate might seem chaotic, to some people, while it's changing because those boundaries are changing, but that's what climate change is all about. Tip 2: Wait for Scott Pruitt's "evidence"
Another thing Judith might try is to wait and see what Scott Pruitt tells the judge. The EPA has been ordered to provide the documentation on which Pruitt relied when he said that CO2 isn't the main factor driving global warming. I think Judith's trying to get away from her uncertainty meme and shift to an argument that "it's all too complicated and hard". She noticed that some people at her second favourite blog, WUWT, criticised her for being too wimpy and uncertain. She made excuses, basically saying that this is based on a US government hearing at which she and Michael Mann were quizzed. She was basically saying that the Democrats on the panel knew enough science to ask good questions of Mann, implying that the Republicans on the panel were all gooses and couldn't think of any science to put to her. The fact people criticised her for being too uncertain isn't surprising. Her main claim to fame is that she used to be a climate scientist so people expect her to have some understanding of climate and say what she does know, not tell everyone how she still doesn't know anything. Susan Hassol says she now has 150 words used by scientists that may be expressed differently so the public can better understand what is being said. Judith got a lot of tips. 552 at last count. They included a lesson in chaos theory from a denier, with some amusing results; advice on further reading (Sun Tzu); and the predictable CO2 causes nothing and scientific research is a waste of time. I expect that comment made Judith wonder if she'd wasted her entire working life. Then again, that's the sort of response she encourages on her denier blog. If you've got a tip for Judith about how to best toss "it's all too complicated for me" onto a single slide, post it below in the comments. Sou. 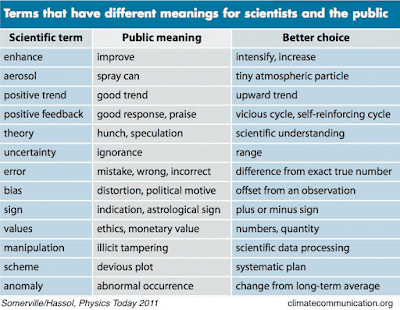 It's scary, reading this article shows you understand climate science better than Dr Curry. Dr Curry's use of the term "chaos" is what the Skeptics call a "woo woo" word, a word that sounds sciency but means nothing. So "equilibrium is fleeting" - really? So Dr Curry is a Milankovitch Cycle denier as well (she just HAS to write a paper on that). In my opinion Dr Curry is willfully engaging in FUD. I do read her blog sometimes and try to read the comments but I don't comment as the number of regular trolls there make any sort of discussion impossible. 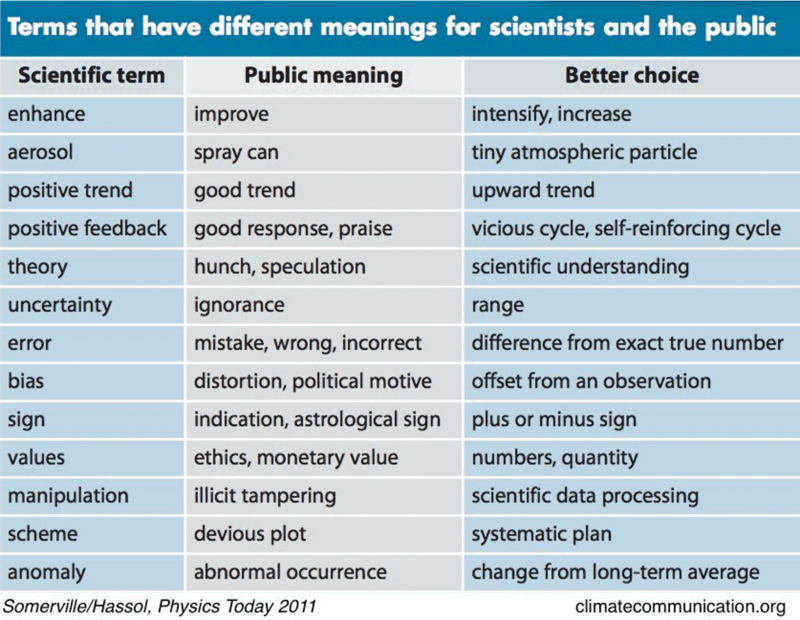 Figure 2 needs an extra column headed "Denier speak". "Average" may be a bit of a slippery idea in some chaotic systems, but probability density is not. In the mathematics of dynamical systems, chaos is defined as sensitivity to changes in initial conditions. In this regard, weather is chaotic, but climate is not. An appropriate analogy is the difference between rolling an honest six-sided die once and trying to predict the outcome and many rolls of the die, whose average approaches 3.5 as the number of rolls increases. A number of years ago, Fred Singer presented at Portland State University.a seminar on the chaotic behavior of climate models. The graphs he used did not show evidence of divergent trajectories; rather, they appeared to represent the trajectories of a low-dimensional strange attractor. I later said as much to the organizer, Aslam Khalil, who had organized the seminar (and who had done so in a way much to his credit). Khalil agreed with my assessment. I get the impression that Curry doesn't much like the company she now finds herself in. Too bad. Lie down with dogs, get up with fleas. It does make you wonder when a former scientist goes to the "dark side" using a very poor grasp of basic scientific truths. Brain tumor? Paranoid delusional? Something is amiss. Curry should just retire and disappear from public speaking altogether. Before she utterly ruins any shred of credibility she still has (as if). 1) do not embark upon said sinking ship. 2) leave when the smarter rats are doing so. 3) end up looking like a very stupid rat. You have a BS degree in ag science and an MBA and you have the temerity to say that Dr. Curry, who holds a PhD in geophysics and was a professor and chair of earth and atmospheric sciences at Georgia Tech, is not a scientist. Not only that, but you continually refer to Dr. Curry as "Judith" - which is one of the most sexist and demeaning ways of addressing professional women. Goes to show that a woman can be sexist, too. Hi Jama. I see you're lost for honorifics and names to call me. "Judith Curry, who used to be a scientist and is now science denier ..."
That seems to be fair comment to me. To be called a scientist you have to actually be being a scientist. You cannot drop in and out when it suits. This blog has not copped a tone-troll for a while :-). The fact that Dr Curry is a climate scientist (and a good one) is what makes what she says more puzzling. That is why people are suspicious of her motives.